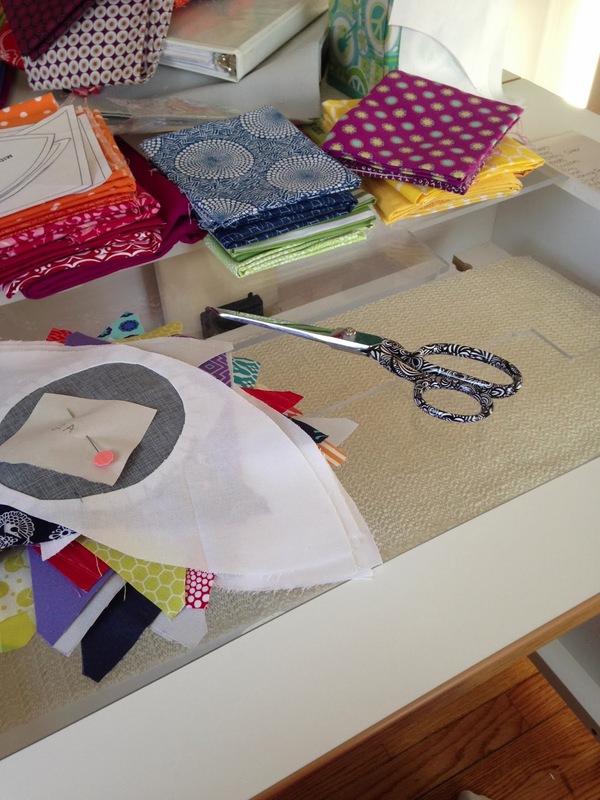 A Quilting Jewel: Getting Ready to Retreat! Our annual BMQG retreat is upon us and I've been very busy getting ready for it. With my longarm out for service for 14 LONG weeks and my domestic in for regular maintenance and to repair the broken handle and thread holder for the past four weeks, I've been spending most of my time cutting. Throw in the craziness of working full time and going to grad school full time, and I'm going through some serious sewing withdrawal. 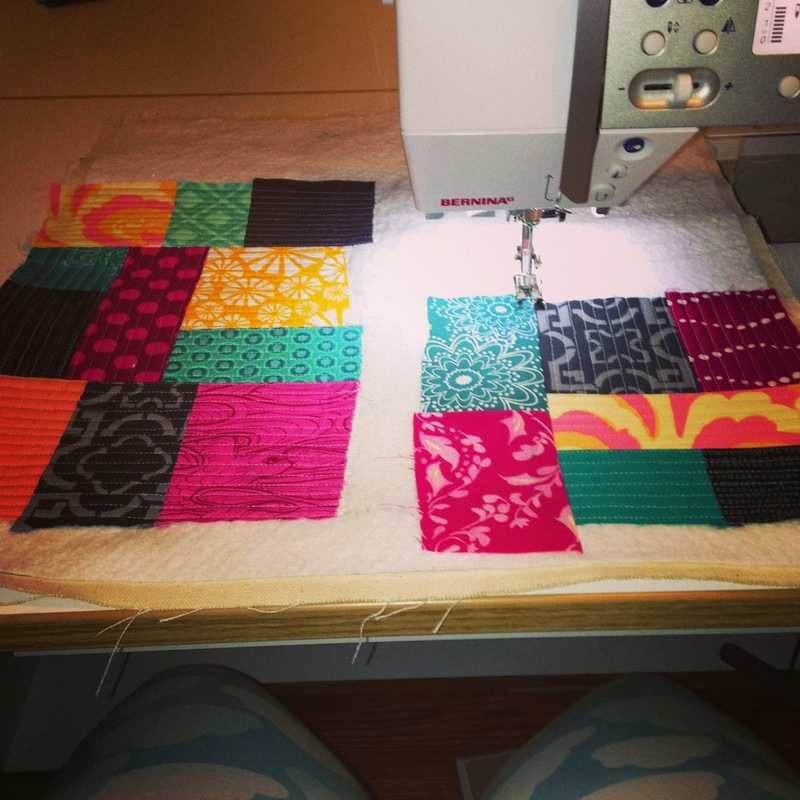 Four days of sewing sounds like pure bliss right now. 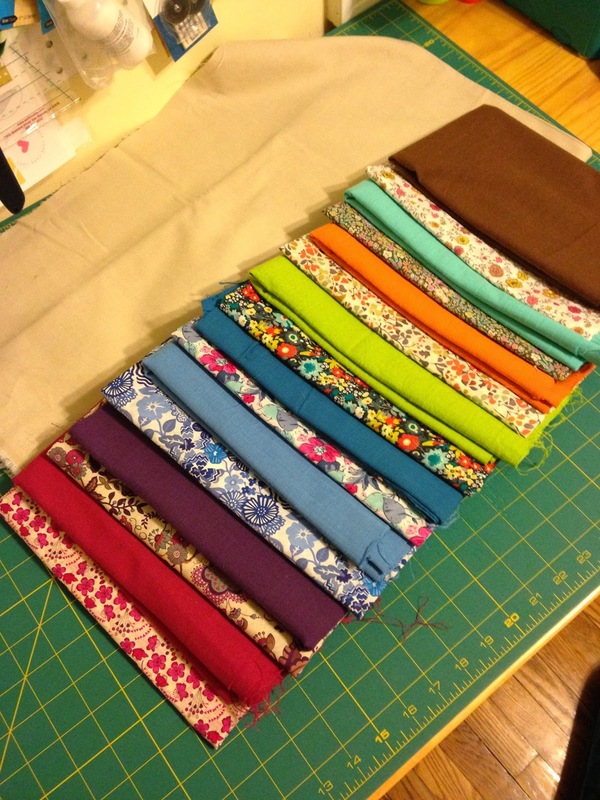 One of my big projects will be to make a quilt using this bundle of fabrics. I'm using a dozen different Liberty of London prints with a coordinating Textured Solids fabric from Andover and a neutral chambray from Robert Kauffman for the background. Let's just say this quilt will be full of different textures. If all goes according to plan, I hope to enter this quilt at QuiltCon and possibly a few other shows with modern quilting categories. I'm also hoping to work on a bunch of WIPs including my Meadow quilt, which I started at the Philly SewDown. I have four of the 20 blocks complete. Below are the first three blocks. I finished cutting the remaining 16 blocks last week, so I might be able to finish this one, depending on how much time I spend sewing vs. talking. I'll bring a few other WIP's with me to work on, but I don't know if I'll get to them or not. Maybe I'll get to my quilted tote, also a WIP from SewDown. And if that's not enough, I brought a few smaller projects to make some zippered pouches and such for some upcoming birthdays and baby showers. Let's just say I'm going to be busy. But that means I'll actually have something to show since I've been so quiet lately. Love those fabrics! Its like fireworks bundled up in one single quilt. I like every single fabric you're adding to it! I hope your long-arm gets fixed soon. Oooh! No sewing for four weeks -- torture! I hope you have a great time at the retreat. I am looking forward to seeing your Meadow quilt and your quilted tote. I haven't finished mine from the Philly SewDown, either. Your fabrics for your big project look great. I hope you can get a lot done on that. And I hope you get your machines back toute suite! Have a wonderful time at the retreat weekend! Can't wait to see what you do with all those lovely fabrics!